Today is actually related to my A post. Characters have to be realistic. For that to be possible, they have to act and sound realistic. Sounds easy, right? Well… yes and no. Because while characters react in certain ways, they also react in certain ways to certain people and situations. Why? Well… because some people and situations people love. Others they absolutely hate. It all comes down to motivation. Which is where today’s headline comes from. In reality, very few people can see other people’s motivations. Even those they love. So most people of forced to take things at face value. You as writer, can’t rely on that when it comes to your characters. Because your readers need to see into the character’s soul. They need at least a glimpse. Well… maybe need is a bit of a strong word, but do you really want your reader to wonder why two characters are fighting? I actually wrote a whole post on motivation that you can read here, for more detail and info on how to use motivation. Today’s focus is on fixing it in edits. Firstly, you need to know what you’re fixing. Motivation isn’t the reason why characters do things. It’s the reason behind the reason (sometimes behind that reason too) why characters do and think things. See it as the main route of ALL decisions, actions, thoughts and ideals. So no… it’s not anger, fear or a dream either. It’s the reason behind those. 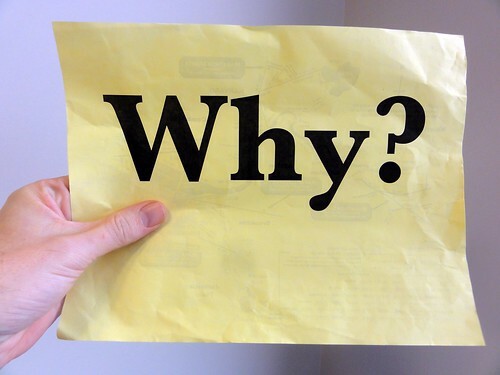 Basically, to find motivation, you need to play the why game. You take something a character does or thinks or whatever and wonder: Why? If you get that answer, you ask again. And again. And again. Until you can’t go back further. Then, you need to make sure that (at least in the beginning) everything tracks back to the same motivations. Because if they don’t, your character has multiple personality disorder. Of course, there are some times that a character acts out. For example someone with major-trust issues overcoming their issues and letting someone into their circle. That’s fine. Just don’t do it lightly. And give the reader a road-map to how and why it happened at some point in the story. If you don’t, the reader will just be confused. Okay… back to the conflict problem mentioned above. If characters don’t like each other, make sure it’s for a good reason. I think it’s best if the dislike comes out of their motivation, because then it flows naturally out of who the characters are. Never will the bickering feel contrived. If it’s based on anything less than the motivation, make sure that it stays as close to the motivation as possible. So yes, even if the reader can’t always see the motivation, make sure you always keep it in mind when editing. More than anything, motivation is the anchor that keeps everything real and believable. 1) Crit partners and Betas pointing something out as seeming contrived in some way. 2) Your “why’s” not adding up to the same character when they’re supposed to. 3) A problem that’s rooted in a character’s motivation being overcome without emotional (or other) turmoil. Do you get to know your character before hunting for their motivations or do you build your characters around motivations of your chosing?